Another grey and wet October Sunday, another game of NFL at Wembley. This year the home team were the San Francisco 49ers who were taking on the Denver Broncos. 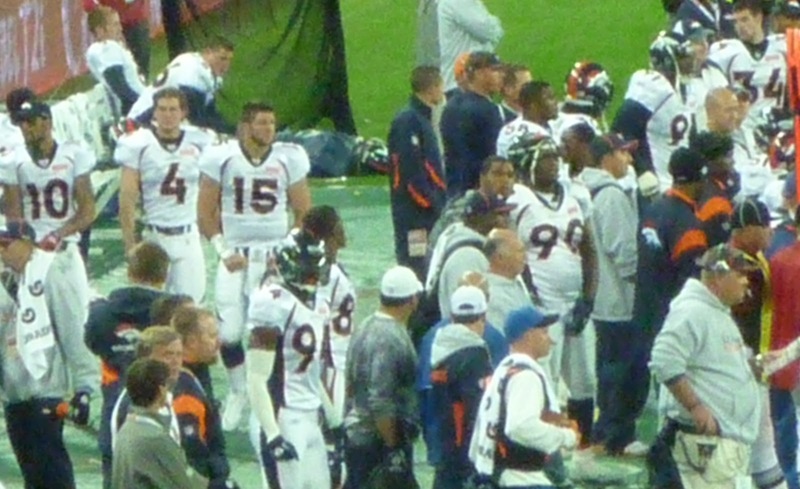 Hopes for the game were not high as both teams were coming to the game with a losing record (Broncos 2-5 and 49ers 1-6). We'd left home at 2pm and had a completely event free journey which meant that we arrived at the Stadium well in advance of the game! Time to take a leisurely stroll from the tube station to the stadium and look down on the Tailgate Party with their impressive section of the Golden Gate Bridge and giant (slightly scary) linebacker. There were the usual assortment of fans in NFL shirts and some slightly more eccentric characters - walking to the stadium were Superman, Spiderman and Batman; and on the concourse this colourful group. Despite the stadiums announcers pleas to fans to take their seats for the pre-game entertainment (My Chemical Romance - never heard them so no real desire to see them) we enjoyed a couple of beers on the concourse whilst playing 'team bingo'. The aim of the game is to spot a shirt of every NFL team... by the end of the day we were only missing Detroit, Arizona and Houston. We went to take our seats and showed our tickets to the steward... who instead of directing us down towards the pitch showed us to the disabled seats. What a wonderfully kind man. It meant that every time my legs or feet started cramping I could stretch them out, and so by the end of the game I could actually walk back to the tube station without being in complete agony. Time for the teams to take the field... along side a massive display of pyrotechnics and through the 'honour guard' of the cheerleaders. Once again the seats in the stadium had flags left on them for the home team - so this was accompanied by much flag waving. The crowd do always get very much behind the team that is the 'home' team, in this case the 49ers. The national anthems were the usual show of patriotism. The Star Spangled Banner went first - in previous years God Save the Queen has never come off so well - it just doesn't have the same 'oomph'. This year the problem was solved by getting guitarist Jeff Beck to play the anthem. Big improvement! shirt numbers) was that Tim Tebow (hero from his days at the Florida Gators, my college team) had come is as quarterback and got the touchdown! All the scoring happened in the fourth quarter with three touchdowns for the 49ers and a field goal and a touchdown for Denver. The crowd went home happy as the overwhelming support was for the 49ers and they won convincingly. It was a good afternoon for my Fantasy Team as 49ers running back Frank Gore gave a good performance and got plenty of yards. Many years ago Rich and I unusually ended up supporting the same team in the World Series - the Anaheim Angels (as they were then). One of their starting pitchers was in his first year in the MLB so whenever the commentators spoke of him he was "the Rookie Jon Lackey". We have continued to call him this - even many years later when he is definitely no longer a rookie and playing at Boston. Frank Gore will now forever be "Ball Carrier Frank Gore" due to the plethora of times that the stadium announcer referred to him thus during yesterday's game. We were fortunate to get out of the stadium pretty promptly - we stopped briefly to thank to lovely steward who had been so kind in giving us the disable seats. We made it all the way to the penultimate horses barrier on the way to the tube before we were held as the congestion eased; and only had to wait a few minutes for a train where we happened to be almost by the doors so we even got a seat. All in all another great day out.